Detroit Lions wide receiver Marvin Jones had himself another great outing at Lambeau Field, as did the rest of his Lions’ teammates, handling the Aaron Rodgers-less Green Bay Packers, 30-17 on Monday night. 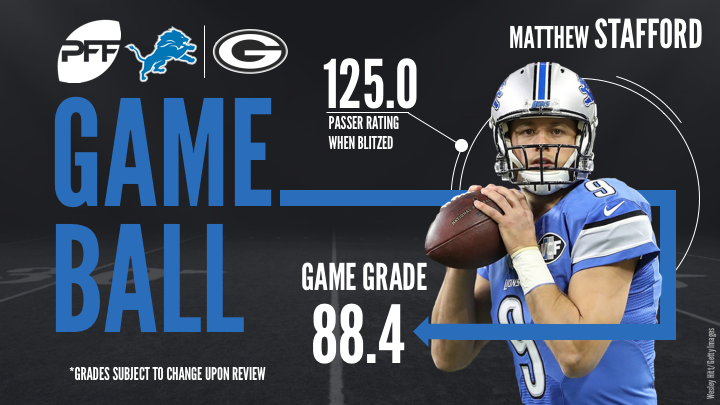 Jones hauled in two touchdown receptions and quarterback Matthew Stafford threw for 361 yards in an impressive performance passing the ball. Stafford connected with Jones and WR Golden Tate on seven receptions apiece, and each wide out totaled over 100 receiving yards in the contest for a Detroit offense that scored their first touchdown on an opening possession this season, and subsequently didn’t look back. Aided by a costly unnecessary roughness penalty on a third and long by Packers DI Mike Daniels, the first of the Stafford-to-Jones scoring throws pushed the Lions out to a 7-0 lead with just 1:50 left in the first quarter. Points came in a flurry late, as the Packers and QB Brett Hundley scored their first touchdown of the night to close the gap to within two possessions at 20-10, but a quick scoring drive by the Lions, capped by the final Stafford-to-Jones scoring throw pushed the game out of reach with just over eight minutes left to play. Rookie running back Jamaal Williams added a rushing touchdown for Green Bay as time expired and with that, we give you our PFF exclusive takeaways from the contest for each team. It was quite a Monday night for Stafford, who made tight throw after tight throw to lead his Lions to victory. His offensive line kept him clean for most of the night and he rewarded them by completing 22-of-26 passes for 290 yards and a touchdown from a clean pocket. Stafford had no troubles pushing the ball downfield, as he completed 10-of-14 for 168 yards and his two touchdowns on passes that traveled more than 10 yards in the air. What a night it was for the Lions’ two star receivers. Tate was Stafford’s security blanket, catching seven of nine targets for 113 yards, 73 of those coming after the catch. Jones was equally impressive, also catching seven passes (11 targets) for 107 yards and two impressive touchdowns in which he fought off tight coverage. Tate finished the game with an extremely impressive 4.91 yards per route run average while Jones was not far behind at 3.24. It was a great night for the Lions’ secondary holding the Packers’ offense to 245 receiving passing yards, with many of those yards coming when the game was in hand. Without much from their pass-rush, the Lions did a solid job on the Packers wide receivers. Hayden was the best of the bunch, allowing only two receptions on four targets for 14 yards with a pass defense. When targeted in primary coverage, Brett Hundley’s passer rating was just 58.3. The next best defender for the Lions was their star cornerback Darius Slay. Slay was targeted only three times, allowing two catches for 13 yards while playing 41 snaps in coverage. When targeted in primary coverage he allowed a passer rating of just 61.5 and earned a coverage grade of 79.3. Hundley had a solid performance for the Packers on Monday night against the Lions. Although he by no means was dynamic, he was accurate when the offensive linemen kept the pocket clean. Under no pressure, Hundley was 24-of-30 for 240 yards with a passer rating of 100.0. When pressured, Hundley was just 2-of-8 with a passer rating of 39.6. The Packers played it safe with their young quarterback with 27-of-35 aimed passes (removing throw aways) traveling under 10 yards. But his few deep shots were not bad but he was unable to get help from his receivers separating to make a catch downfield. It was a great night for the Packers offensive linemen is pass protection on Monday. Only six pressures were charged to the offensive line on 43 snaps in pass protection. The best of the bunch was Jahri Evans, who did not allow a pressure the entire game and was the Packers’ best run blocker, finishing with a 78.8 run blocking grade. While the Lions were able to pass the ball at will, they really struggled to run the ball against the Packers. That was largely thanks to Daniels up the middle, who was constantly disrupting plays and shedding blocks. Daniels finished with a run defense grade of 91.7 despite not actually making a run stop. He was a huge reason that the Lions managed to rush for just 65 yards on 33 carries. Ryan was another player who excelled in his run defense for the Packers defense on Monday night. He finished the game with three solo run stops on just 13 run defense snaps which was good for a run stop percentage of 23.1 percent, the highest among inside linebackers this week. Ryan now has a run stop percentage of 8.7 percent on the season in his limited snaps.